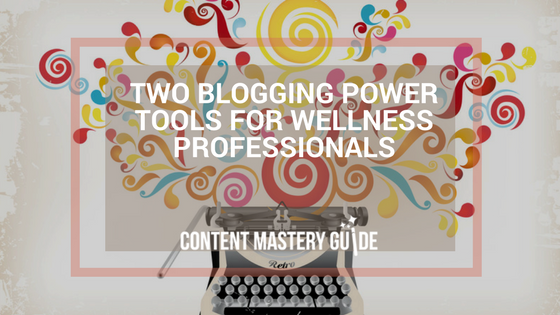 Many wellness professionals know the benefits of blogging, yet their haphazard approach isn’t getting positive results. Some get overwhelmed by a floodgate of ideas but don’t have a structure for getting them finished and published. Others experience “blogger’s block” when they sit in front of a blank screen. To be strategic about blogging you need to step back and take a broader view of your overall business and marketing goals. Then you can plug in the details of how blogging will help achieve these things. This strategic process will yield a set of categories – central themes that intersect your expertise with your clients’ concerns. This list is key for staying on track with your blogging and putting your readers’ needs first. An editorial calendar is a centralized document accessible to all your blog’s contributors (team members, guest experts, etc. ), where you compile a list of planned blog posts for the next month, quarter, six months, year, etc. If your primary goal is to keep yourself and others on task and be sure posts go out as planned, the free project management software Trello might be a good choice for your editorial calendar. You can create one list for each phase (idea, in production, etc. ), and then easily drag and drop a blog post to a new column when its status changes. Note: While you can use Trello’s color-coded label system for categories, keep in mind that you’ll be limited to only six labels. Because my blog and most of my clients’ blogs have more than six categories, I tend to use a customized Google spreadsheet for collaborating with clients about topic ideas for each category. Then I manage the production calendar in my own Wunderlist system. With an editorial calendar as a blogging power tool, you’ll be able to plan posts around holiday themes, clinic schedules, and marketing events, and be thinking about and working on your posts long before they’re scheduled to publish. With your blogging calendar, you’ve created a set of content “buckets” – categories that are aligned with your prospective customers’ needs and interests. With those buckets in the back of your mind, I guarantee you will start to see and hear blog post ideas all around you. When that happens, you need a place to capture your thoughts so you can either add these notes to existing posts on the calendar, or create new post ideas for later. The bonus is that when you sit down to work on a blog post, you’re not starting from a completely blank page. The best idea catchers are the ones you’ll actually use. Experiment with applications that sync across different devices, such as Wunderlist, Trello or Evernote. See which one feels most comfortable – and even fun! Always have a low-tech option at your fingertips as well, such as a simple notepad and pen. By creating a structure for your blog with an editorial calendar and category buckets, you keep on track with a consistent schedule and spark your creativity for new ideas. With your mind continually working in the background on filling in that structure, an idea catcher will ensure you never lose a single idea – OR have to start with a blank page. Start today by creating a simple calendar of posts for the next three months (there’s one included in my free blogging plan workbook). Then be sure to put an idea catcher in place because your creativity will be sparking!